The ongoing G20 finance ministers meeting will discuss the global economy’s perennially unresolved problems and will also present Moscow with a real opportunity to promote its own interests. Russia is chairing the April 18-19 meeting of G20 finance ministers and central bank governors in Washington, DC, as part of the spring session of the International Monetary Fund (IMF) and the Word Bank Group. The main purpose of the upcoming negotiations is to make preliminary decisions on a wide range of issues with subsequent discussion and approval at the level of G20 heads of state. The agenda includes some of the most ambitious and sensitive issues dogging the global economy: the implementation of a framework agreement on sustained, steady and balanced global economic growth, investment finance, and financial regulation. At the same time, Russia intends to propose that measures be included to create a mechanism for the automatic prevention of financial crises (like the one that has recently happened in Cyprus) in the G20 communiqué. “I believe that we could reach a consensus on this,” Russia’s Finance Minister Anton Siluanov said in remarks on the Russian delegation’s plans for the Washington talks. At a similar meeting in Moscow in February 2013, the participants had to admit that, despite the targets set at the 2010 Toronto G20 summit to cut debts and budget deficits, some countries had failed to achieve those objectives. The slow pace of economic recovery and greater than expected sensitivity of economic growth to budget spending cuts were the main reasons behind this disappointing performance. The Russian Finance Minister added that the deadline for the governments to comply with these obligations could be pushed back to 2016; as a matter of fact, the Toronto targets will need to be revised, even though the G20 is still committed them. 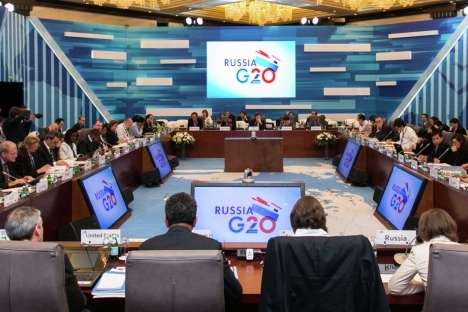 According to Siluanov, following the Moscow talks, Russia expected the G20 to make progress by April on achieving a balanced approach to setting new targets for budget deficits and public debt levels. However, the search for specific measures that would help resolve the problem of global economic imbalances continues and is unlikely to be completed in time for the Washington talks. Both economic experts and G20 finance ministers have a hard time identifying a specific recipe for stabilising the global economy. Economist and head of Neokon consulting Mikhail Khazin, for example, was pessimistic about the meeting in Washington, adding that it would yield few results ­ just like the Moscow meeting before it. “The only real way to eliminate the global imbalance is to cut public spending by 20–25 percent and in the case of Europe and America by as much as 50 percent, which will lead to a social catastrophe. That’s why nobody will agree to this,” Khazin told RIR. Leonid Gusev, an expert with the Institute of International Studies, was more upbeat and said that Russia’s main task is to actually promote its own interests rather than merely do lip service to them.